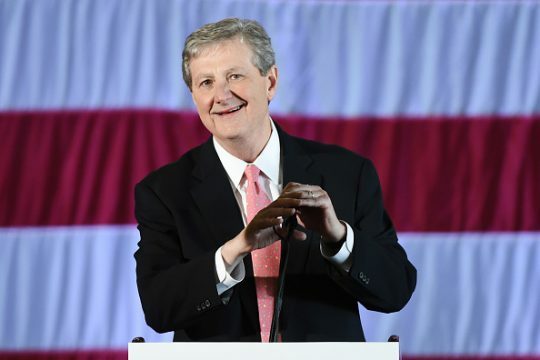 Sen. John Kennedy (R., La.) joked at Tuesday's state dinner about the fact France sold his home state of Louisiana to the United States in 1803. Kennedy, referring to the Louisiana Purchase of the early 19th Century, said he wanted to thank France for making the sale, according to a White House media pool report. Kennedy was attending a State Dinner at the White House hosted by President Donald Trump and First Lady Melania Trump in honor of French President Emmanuel Macron and his wife Brigitte. The Louisiana territory purchased from France in 1803 included land from fifteen present U.S. states and two Canadian provinces. It included land that forms present day Arkansas, Missouri, Iowa, Oklahoma, Kansas, and Nebraska, as well as portions of Minnesota, North Dakota, South Dakota, New Mexico, Texas, Montana, Wyoming, and Louisiana. French influence in Louisiana is still very strong and is particularly apparent in New Orleans. At part of the state visit the first of Trump's administration, Macron will address a joint session of Congress on Wednesday. The first foreigner to do so was French aristocrat and military officer Marquis de Lafayette, whose portrait hangs in the House chamber. This entry was posted in Culture and tagged France, Louisiana. Bookmark the permalink.